It's not often that I think of a book years after I last read it, but Liane Moriarty had that effect on me with What Alice Forgot, which I read back in 201l, when we first featured her at CLC. Since then, I've made sure to get my hands on everything else she has written before and after that amazing novel. 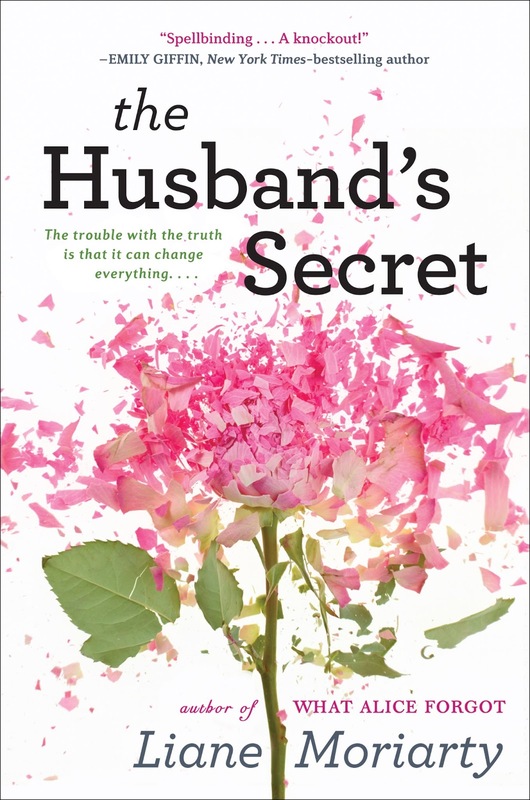 This time around, it is The Husband's Secret, which is powerful and intense, and makes you think about life circumstances in a whole new way. I know this one will be sticking with me for a while, as well. (See my review for more information.) Besides being blown away by Easter taking place in autumn where Liane lives (she's in Australia), I enjoyed getting to know more about her home life and travel adventures this time around. 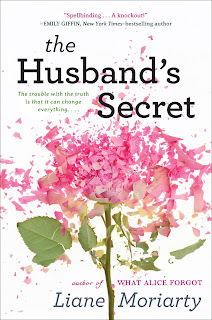 Some lucky US readers can also get a glimpse of everyday life Down Under if they win one of FIVE copies of The Husband's Secret, thanks to Amy Einhorn Books. You can learn more about Liane by visiting her website and on Facebook. I guess it would have to be my bathroom because of my habit of reading in the bath. I adore long hot bubble baths with a book. If I have a bath in the middle of the day (and I find many excuses for this princess-like indulgence eg. I’m cold, I have a slight headache, I’ve been working very hard, the children have been driving me crazy etc etc) I can open the shutters in my bathroom and lie in the bath and see the sky, and, depending on the time of the year, the pale purple blossoms of our jacaranda tree. It’s a very green, leafy suburban area with lots of young families. We can walk around the block to our local shops and see mothers pushing prams and kids on bikes and scooters. I love the sense of local community. I always remember a day when my little boy fell over at the park and grazed his knee. On our way home we did some shopping and everywhere we went we displayed his injury. He scored a chocolate frog at the fruit and veg shop, a sticker at the chemist, a toy car at the newsagent, a marshmallow at the coffee shop and stamp on his hand at the butcher. Tell us one feature that would be a must-have for the house of your dreams. What is the funniest thing that ever happened to you while traveling? Mmm. I guess it’s sort of funny in retrospect to remember the time I got very sick on a camping trip in Turkey, and the doctor and I passed a phrase book back and forth, before he gravely stubbed out his cigarette and diagnosed me with asthma. We went interstate to Tasmania. It’s the little island at the bottom tip of Australia. The Easter Bunny came to our hotel room. The children were delirious. Chocolate-smeared little faces. Special thanks to Liane for another lovely visit and to Amy Einhorn Books for sharing The Husband's Secret with our readers. US only. Giveaway ends July 30th at midnight EST. I have a library in our house, so right now that is my favorite room - mainly because of my books and it is the only room that is finished! Probably our family room. It's the best place to gather and for the kids to play! My favorite room in the house is the kitchen. Everyone always seems to gather there to talk even if no ones cooking or eating. The kitchen. We have gathered and talked while we cooking with the kids for years. I have a "mom cave " that is a little sitting room off the master bedroom. Not big and houses a hand-me-down couch but all MINE. My favorite room is probably the kitchen - hahaha! Nomnomnom! I really don't have a favorite room in my house. But, if I have to pick one, I'ld say the bedroom because it's where my computer lives (and I spend a lot of time here). We just got a new sectional, I love to snuggle into the corner and read - so that is my favorite spot in my house! LOVED What Alice Forgot - it really stuck with me! I would have to have a quiet spot (does not need to be a separate room) with a soft, comfy chair, good lighting and lots of books nearby. I’m a reading freak and this is all I ask for. My favorite room in my house is my living room. Currently my house is a complete disaster after having my mom and brother-in-law move in with our already family of four. Nothing feels organized and it feels like nothing ever stays clean or put away for long. If I had to choose my favorite room I'd have to say my bedroom because it is one of the few places I can retreat to where everyone will think twice before barging in. Love that Liane's favorite room is all about long, hot bubble baths. That used to be my escape too but we only have one bathroom so I've had to forgo that baths. Family room is my domain. I write and read in there. The favorite room in my house would be the living room. That's where most of the books reside. My husband built me a bookcase on both sides of the window and a window seat. Love it! Favorite room in my house is my bedroom. it is all mine, calming and comfortable! The kitchen, it's so big and inviting! We're moving out soon, though, and I'm going to miss it. I hope we can find a house with one as good as ours! The sunroom which is also my office and my little hideaway. My favorite room in the house is the living room because the TV lives there. My favorite room in the house is definitely the bedroom! My favorite room is my bedroom by far! I love our sunroom! Such a bright, comfy place to read and hang out! my kitchen is my favorite room. THat's a tough question...I love our family room and I love my master bathroom (big tub). But we just put a roof over our patio, now it is like a huge outdoor room which is currently the favorite (until it gets too cold to be outside). I love the kitchen! Not only does it contain and make delicious food, but it also has enough open space that we can practice dance routines and exercise in it. I like to jump rope in the kitchen. Since my knee replacement surgery last November, my bedroom has become my favorite place. I can hide away in there and enjoy the quiet away from all of the dogs except my own little one. My favorite room is our den.